In 1832, Georges Antoine Belcourt established the mission of St. Paul des Saulteaux on the south side of the Assiniboine River, west of Red River’s settled riverlots. He was intent on forming an agricultural training settlement, but decided that he would be vulnerable to continuous attack from A’aninin/ ‘White Clay People’ First Nations (a.k.a Gros Ventres/ ‘Big Belly’/ Piik-siik-sii-naa/ ‘Snakes’) who were reputedly hostile to his target congregants. By 1834, Belcourt had moved the site of his farming mission to Wabassong on the north bank of the Assiniboine and further to the east where he was more likely to attract Aboriginal families interested in his ideas about settlement (some of whom appear to have been A’aninin, most of whom were Métis, though Belcourt probably identified many as Saulteaux on the basis of what language he judged them to be speaking). Also in that year, the Nolin sisters, Angelique and Marguerite (Métis), began teaching at the mission. The new site was a traditional meeting place for First Nations (at the time principally Saulteaux), as well as for Métis. From this place a trail — probably ancient — subsequently known as the “Mission Trail,” led to Manitobah (a settlement that dated back at least to 1818 and was used by some inhabitants on a seasonal basis; a.k.a. Fond du Lac/ St. Laurent and Oak Point) on the southeast shore of Lake Manitoba. In 1870, the settlement of Manitobah did not have separate representation in the Legislative Assembly of Assiniboia. I have found no clear indication of how the inhabitants were represented (or whether Duck Bay, Pine Creek/ Camperville and White Mud were considered part of Manitobah, or of Poplar Point, or St. Margaret’s/ High Bluff). Because the settlements of Baie St. Paul and Manitobah were connected by relatively close family ties as well as by a trail that implied the people at Manitobah were considered to be outlying ‘parisioners’ of Baie St. Paul (though they had a mission station of their own by 1858), I have opted to include the inhabitants of Manitobah under a separate sub-heading in the list below. For the purposes of the election of members to the Legislative Assembly of the Provisional Government of Assiniboia, the White Horse Plain portion of the riding apparently included anyone living to the north of the riverlots (and of any 2 mile hay privilege attached to those lots) along the north bank of the Assiniboine River between Sturgeon Creek and Long Lake – a stretch that included the lots of Headingly, St. François-Xavier, and Baie St. Paul. Prairie du Cheval Blanc was also known as Prairie of the White Horse/White Horse Plains. [See A.-A. Taché, remarks, in Report on the Exploration of the Country Between Lake Superior and the Red River Settlement and between the latter place and the Assiniboine and Saskatchewan, by S.J. Dawson (Toronto: John Lovell, 1859), 43] The parish had previously (to about 1859) been co-extensive with St. François-Xavier – which shared the same chapel. The original inhabitants of Prairie du Cheval Blanc had been “several hundreds of hunters who pass the year on the prairies, but at certain times visit the colony.” A “great number” of these people (likely women) spoke Cree and Saulteaux exclusively (though it is safe to assume Michif was fairly common as some of the men also spoke French and English). By 1870, with the decline in the number of buffalo and the rise in the number of people in the community, some individuals settled with permanent homes, although others remained seasonal inhabitants only. 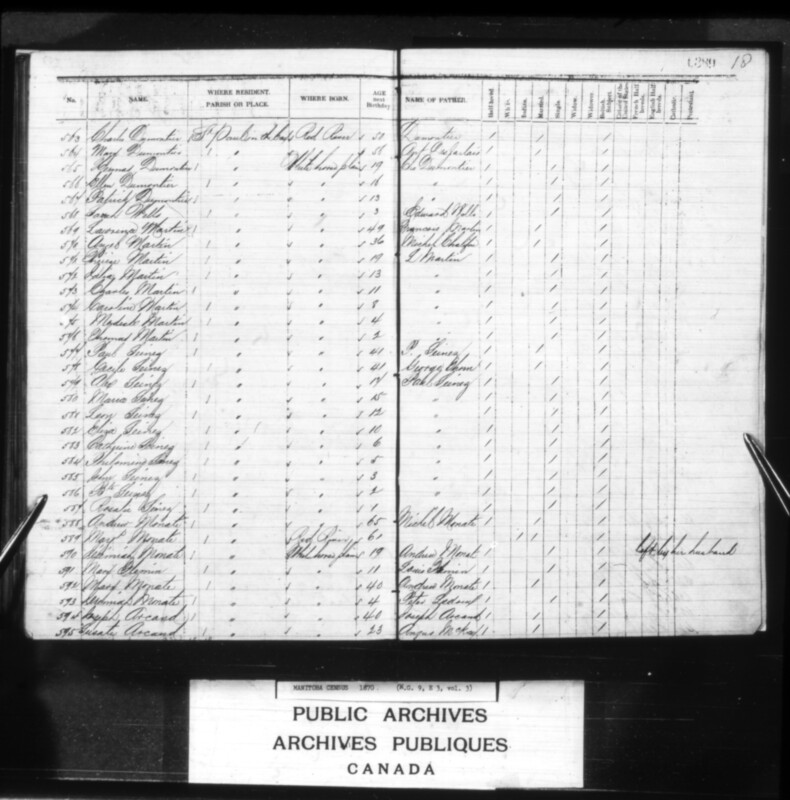 It is not clear, from the preliminary sources used to compile this list, who lived on White Horse Plain — it was not enumerated as a separate district in the Archibald census of 1870. The boundary of the riverlot parishes and the White Horse plain was perhaps sometimes determined by a road (Portage Trail/ Carlton Trail) that ran parallel to the river, but in a straighter path, so that where there were deep bends in the river the road might have cut across properties. Consequently, some homes might have been located to the road’s wooded south and others to its north, out on the plain. Or, possibly the location the Hudson’s Bay Company Lane’s Fort (a.k.a. Lone’s Fort), and a home’s proximity to it had something to do with determining where riverlot parishes ended and White Horse Plains began. At any rate, in 1870, St. François-Xavier east and White Horse Plain appear to have overlapped at Hon. Pierre Poitras’ residence and those of Pascal Breland and his son Patrice Breland [See “The People, St. Francois-Xavier part 2,” this site]. As with Poitras and the Brelands, the remaining people who voted in 1870 as constituents of White Horse Plain are probably currently listed as living across the electoral boundary in the neighbouring parishes of Headingly and St. Francois-Xavier as well as at Baie St. Paul, though they will be shifted to this list if additional research suggests that would be appropriate. Most inhabitants of this electoral riding professed to be Catholic. People who professed to be Protestant are marked ‘P’ below. Possibly a rancher, who moved west. According to her scrip affidavit (1876), Catherine resided with her husband in St. James Parish on 15 July 1870. See genealogy. Joseph Harwood Kirton was a farmer, who had been brought in to work the HBC experimental farm under Captain George Marcus Carey. – [326-330] LaRose 11, William Jr. 9, Isabelle 7, Julia 5, Veronique 3. A brief scrip record for Angelique lists additional children. William Swain Jr., like his father, worked as a voyageur in 1879. – [333-334] Pierre/ Peter 4, Marie/ Mary 2. Apparently, Louis Bruyere’s first scrip affidavit was “burnt in C.P.R. Mail Car.” According to the declaration of 1885, given at Willow Bunch by Josephte (which lists additional children), she lived with her parents at St. Norbert to 1865. She then travelled with her husband on the buffalo hunt, living for the most part on the plains (often at Moose Jaw, Cypress Hills, and Wood Mountain). 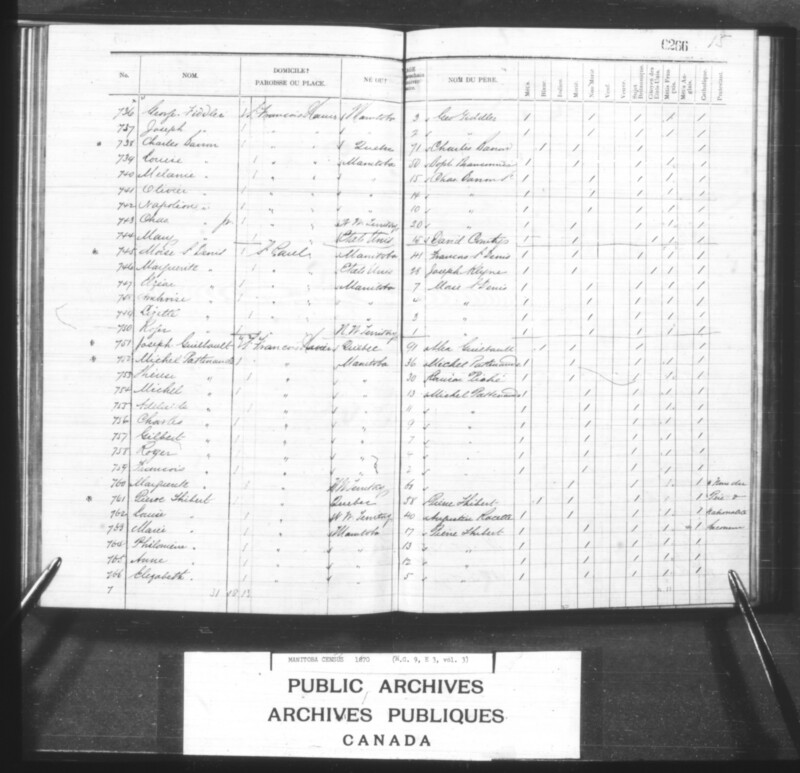 She and her husband did not own land at the settlement, so when at Red River, they lived at Baie St. Paul “in a small log house built upon the house of my father in law.” She also said that she was living at Whitehorse Plains in 1870. – [337-343] Lucie/ Lucy 19, Jeremiah/ Jérémie 17, Cleophas 14, Caroline 12, M. 8, Ambroise/ Ambrose 6, B.?C. 3. 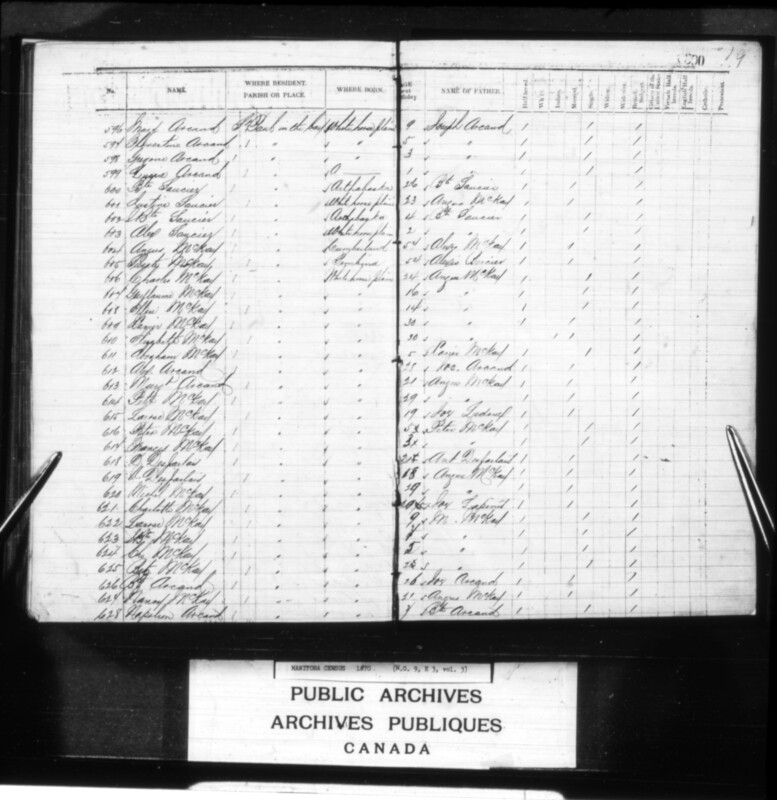 The scrip affidavit for Jean Baptiste Bruyere [misfiled online] lists him as a plains hunter residing at Baie St. Paul on 15 July 1870, and in St. Francois Xavier in 1878. 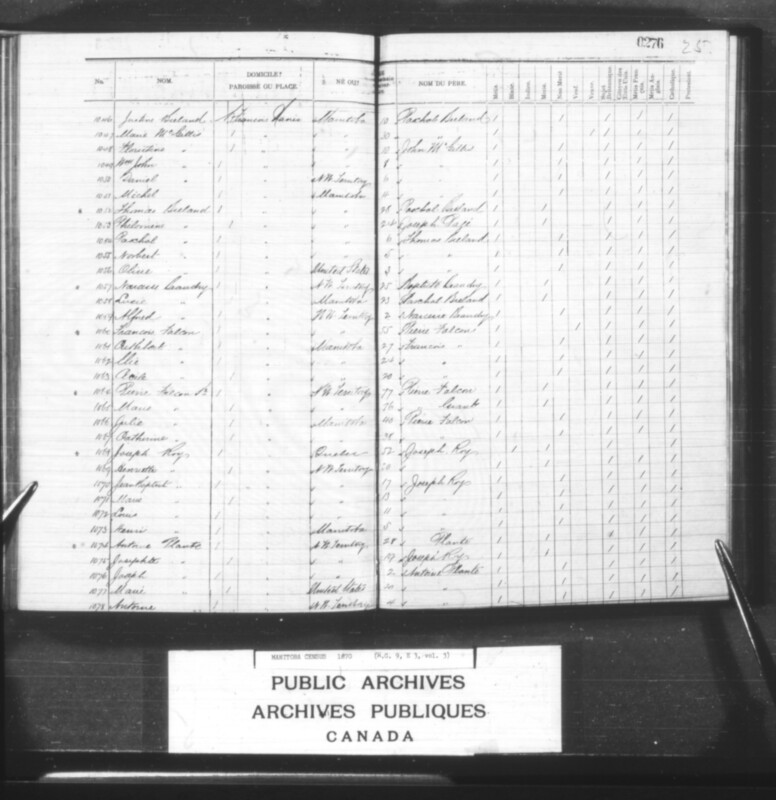 Daughter Lucie married Michel Richard, farmer at Baie St. Paul, and according to her scrip affidavit was living with him on 15 July 1870. According to son Jérémie’s affidavit, he was born at St. Francois Xavier. As of 1875 he resided at Baie St. Paul, occupation labourer, and was married to Eliza Allary (daughter of Francois Allary and Chatlotte Malaterre; all of whom were residing “in a house” at Baie St, Paul on 15 July 1870). This was a family involved in the buffalo hunt. They travelled among such locations as Q’Appelle, Lebret, Moose Jaw, Regina, Wood Mountain, and Cypress Hills [SK], St. Michel [North Dakota], and Montana; sometimes staying at St. Francois Xavier Parish on a return to Red River. – [349-356] Marguerite 18, Azarias 16, Jean Baptiste 14, Napoleon 12, L. 9, Mary 7, Gregoire 5, L. 3. 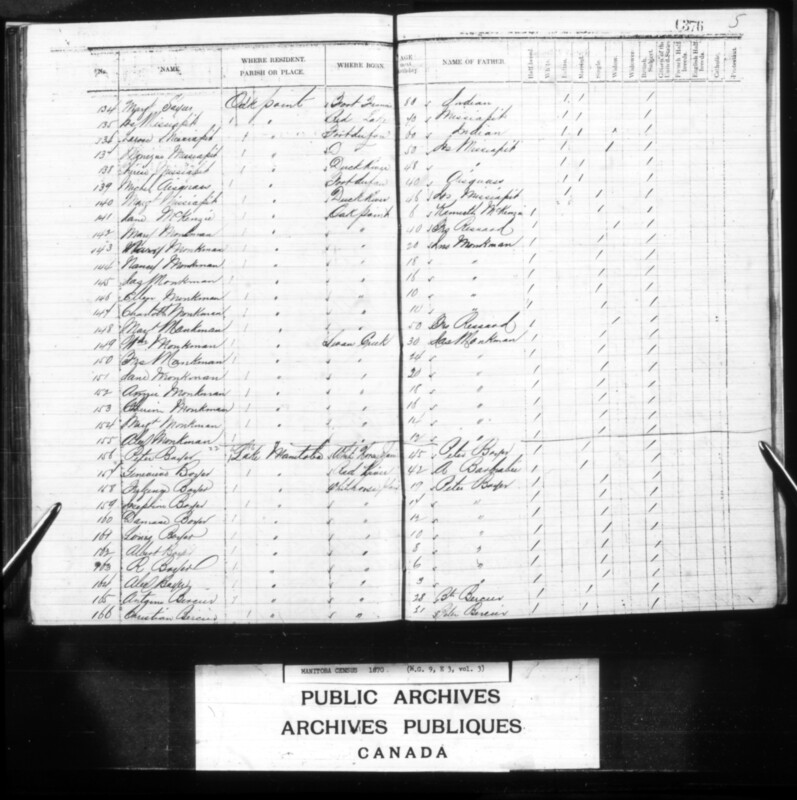 In 1875, Isidore Boyer attested he was a farmer at Baie St. Paul. That same year, his sons Azarias and Jean Baptiste Boyer attested they were born at St Francois Xavier and Baie St. Paul, respectively, and that their parents were residents in the parish in 1870. As of 1875, both sons still resided at Baie St. Paul and worked as labourers. – [360-364] Michel 22, Antoine Jr. 20, Eliza 18, P. 15, Boniface 13, [365-367] Lazarus 11, Isidore 10, Pauline 5. 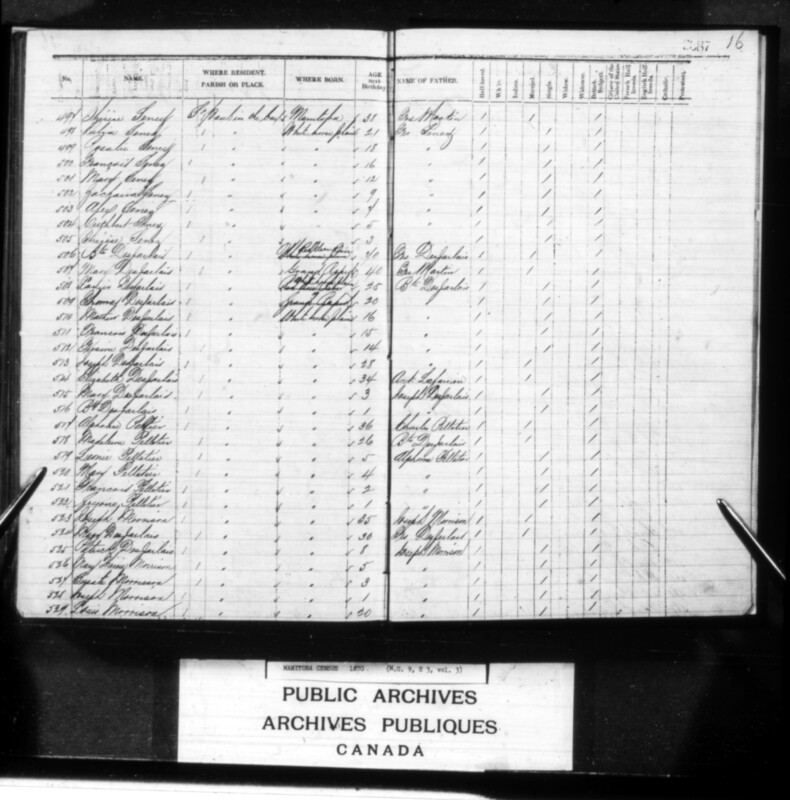 The scrip affidavits of Antoine Richard and Josephte Lapointe-Richard (1875) both indicate this was a farming family. 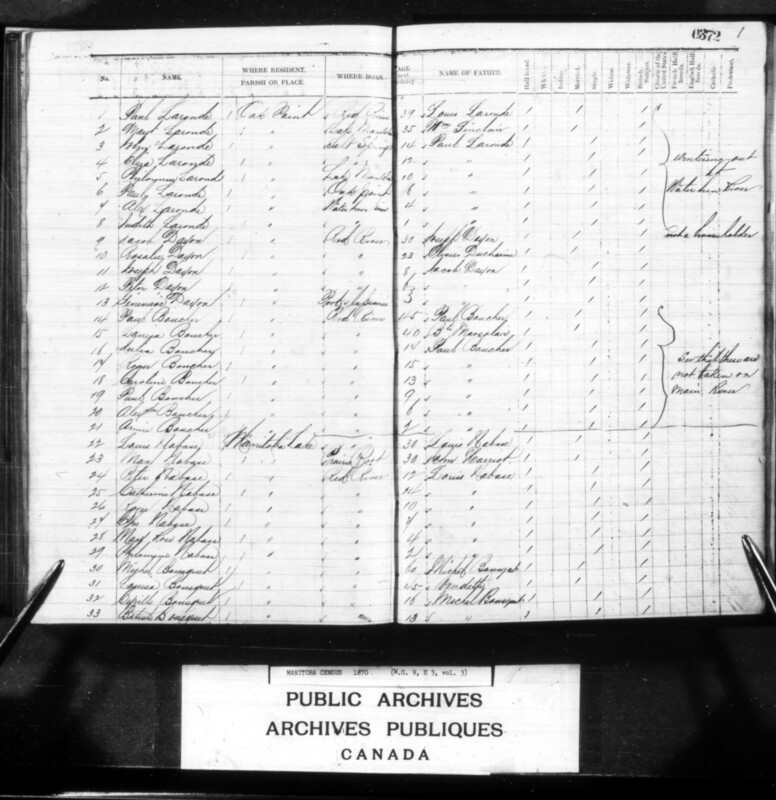 The affidavit of Michel (1875) lists his place of birth as St. Francis Xavier Parish; his residence, with his wife, as Baie St. Paul; and his occupation as farmer. The scrip affidavit of Antoine Jr. (1875) lists his place of birth as St Francis Xavier Parish, his residence as Baie St. Paul, and his occupation as farmer. The scrip affidavit of Boniface (1875) lists his place of birth as St Francis Xavier Parish, his residence as Baie St. Paul, and his occupation as labourer. – [370-376] André/ Andrew 16, Joseph 13, Marguerite 11, Albert 9, Cuthbert 7, Charles 5, Marie 2. The declaration of Therese Valee indicates that up until 1872, this had been a buffalo-hunt family. In 1887, Joseph Trottier Jr. declared that he had been born at St Francois Xavier Parish; had taken treaty (with the Beardy Band), but was seeking to be discharged; and was currently a labourer at Green Lake. In 1879, he had married Julie ‘La Grosse Tête’ St. Denis. She was the daughter of Francois and Therese St. Denis of Baie St. Paul and had resided “in a house of my own” in that parish in 1870. In his affidavit of 1875, Alexis Mckay described himself as a farmer. He received scrip in 1876. In her affidavit of 1875, Mary described her husband as a labourer and her father as ‘an Indian.’ She received scrip in 1876. – [381-383] Baptiste 7, Mary Jane 4, Madeleine 2. In his affidavit of 1876, Jean Baptiste Allary described himself as a farmer. He received scrip in 1877. – [388-393] Jean Baptiste 19, Clemence 17, Bazile 15, William 13, Louis 10, John 7. In their affidavits of 1875, Louis Fleury and Margurite Trottier described Louis as a farmer. Their son Jean Baptiste likewise described himself as a farmer, living in St. Francois Xavier Parish, and married as of 15 July 1870. Their daughter, Clemence, also described herself as married in 1870 (to Alexis Ledoux, a farmer) and as living at St. Francois Xavier. – [396-397] Mary 3, William 1. 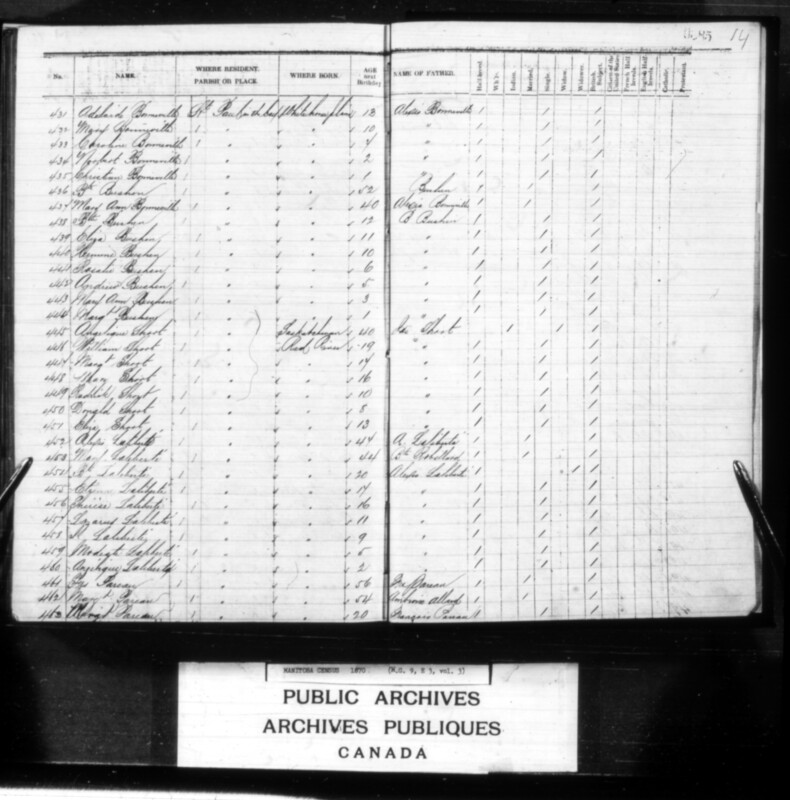 In their affidavits of 1875, Baptiste Lepinée and Julie Fleury described Baptiste as a farmer. – [400-401] Baptiste 2, Mary 1. 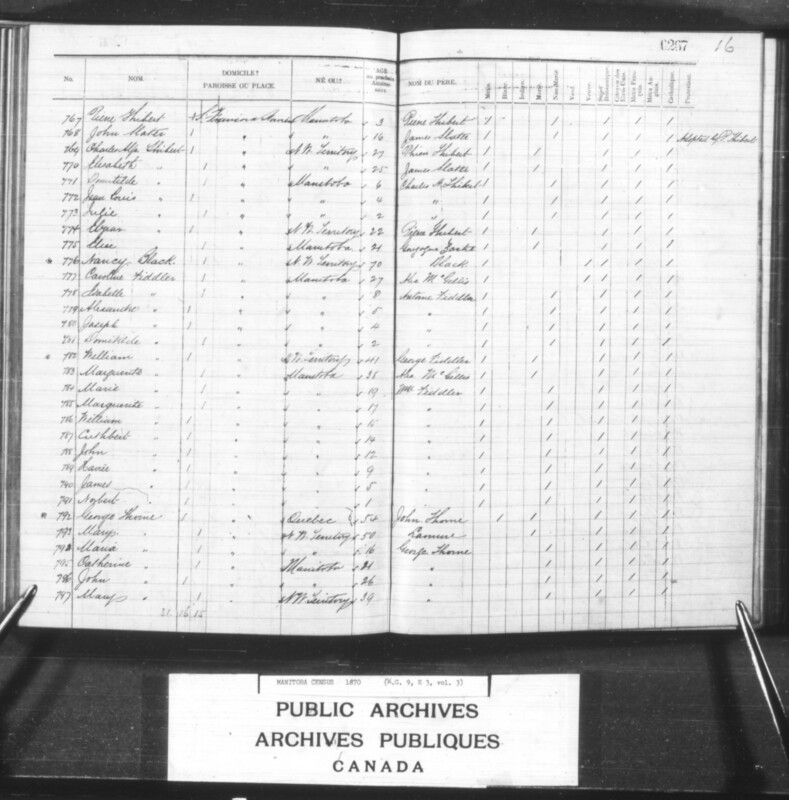 In their affidavits of 1875, Charles Houle and Julie Fleury named St. Francois Xavier as their parish of residence in 1870 and described Charles as a farmer. – [404-410] Louis Jr. 15, Julie/ Julia 15, Mary 13, Antoine 9, Isabella 7, Frisine 5, LaRose 3. In their affidavits of 1875, Louis Desjarlais Sr. and Julie Chartrand described Louis as a farmer. In his affidavit of 1875, Louis Desjarlais Jr. also described his father as a farmer. – [413-417] Benoit 13, Ambroise 11, Adelaide 8, Julian/ Julienne 6, Alexis 2. In 1875, in his affidavit for himself, and in that made on behalf of his children, Narcisse Pepin described himself as a farmer, as did his wife Marie in her affidavit. – [420-421] Jean Baptiste 5, LaRose 2. In their affidavits of 1875, Alexis Goneville Jr. and Marie Pepin described Alexis as a farmer. – [425-430] Antoine 35, Elizabeth 33, Suzette 32, Eliza 23, Marguerite 21, Lucy 18, [431-435] Adelaide 13, Mary 10, Caroline 7, Norbert 2, Christian 1. In his affidavit of 1875, Alexis Goneville Sr. described himself as a farmer. – [438-444] Baptiste 12, Eliza 11, Hermione 10, Rosalie 6, Andrew 5, Mary Ann 3, Marguerite 1. – [446-451] William 19, Marguerite 17, Mary 16, Eliza 13, Roderick 10, Donald 8. See genealogy. In his affidavit of 1875, William Short described himself as a farmer. – [454-460] Baptiste 20, Etienne 17, Therese 16, Lazare/ Lazarus 11, I.? 9, Modeste 5, Angelique 2. 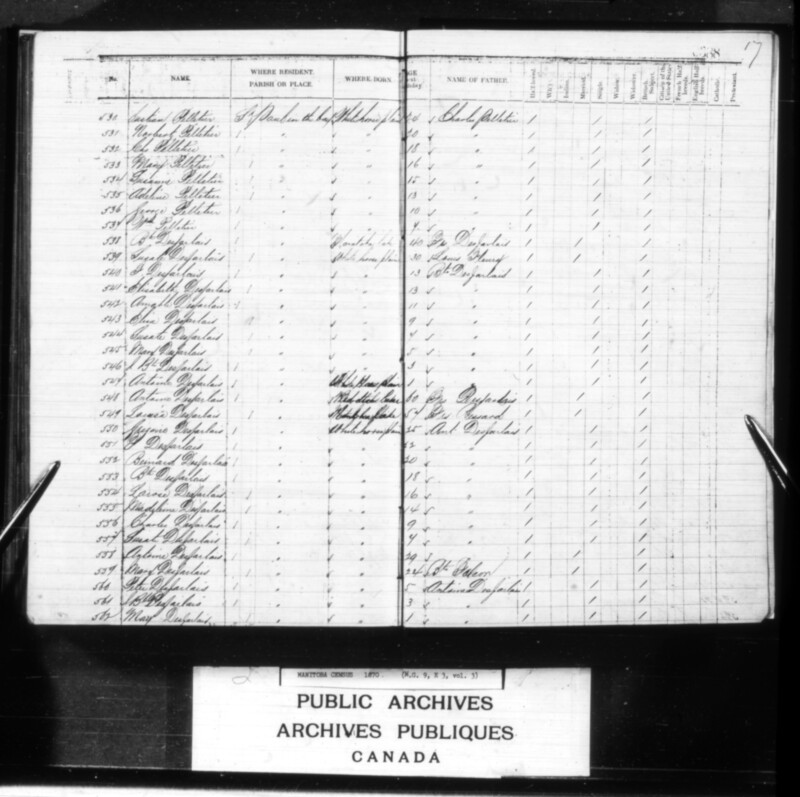 In their affidavits of 1875, Alexis Laliberte and Marie Robillard described Alexis as a farmer. Their son, Baptiste, also described himself as a farmer. 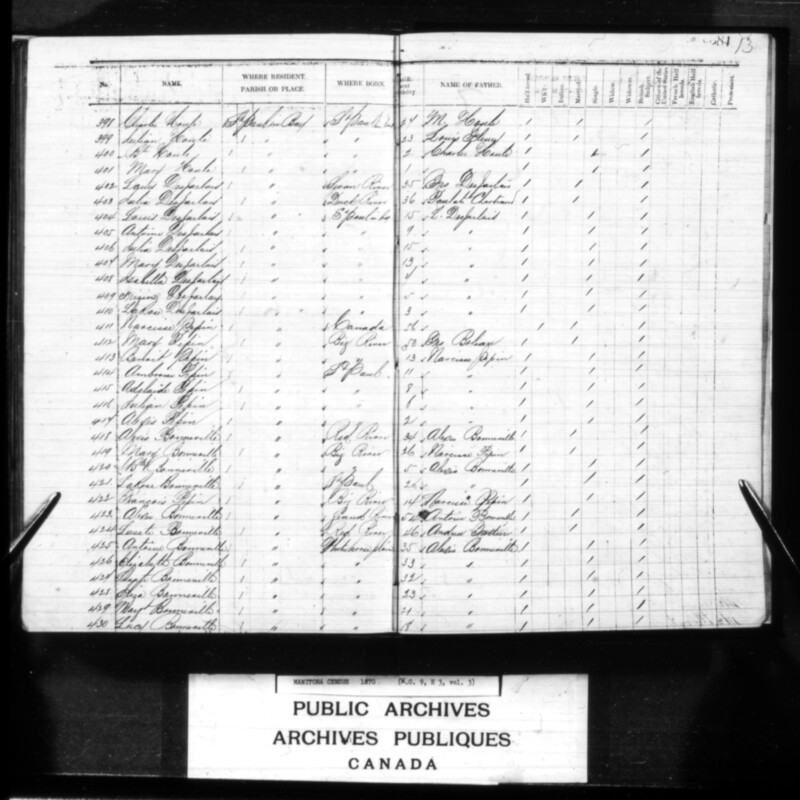 In their affidavits of 1875 Francois Perreault and Marguerite Grant described Francois as a farmer. – [466-471] LaCadie 14, Mary 12, Camille 9, Louisa 8, Jean Baptiste 6, Philomene 1. In his affidavit of 1875, Xavier Perreault described himself as a farmer. 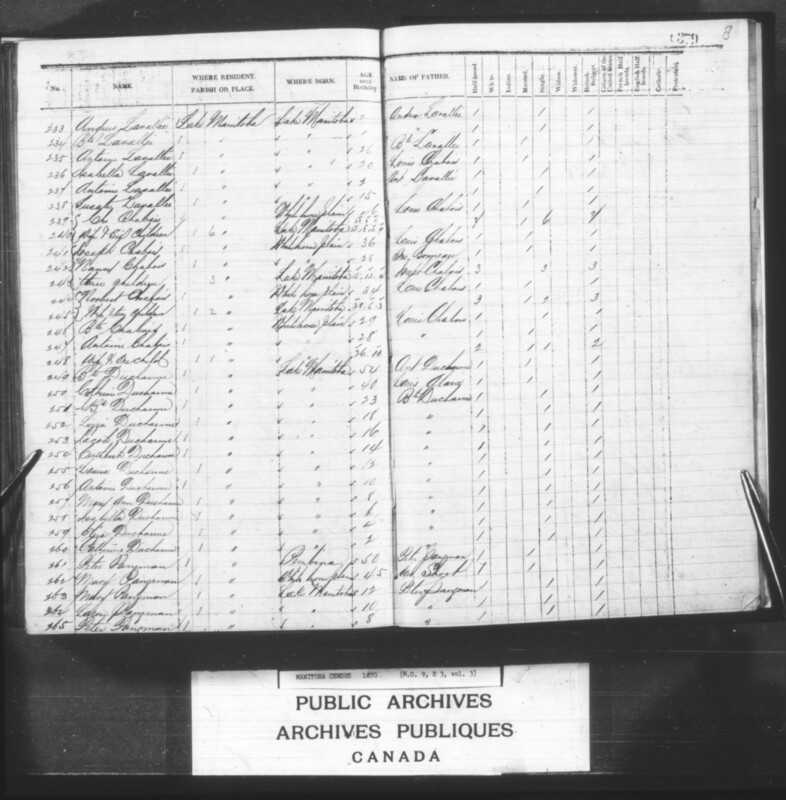 In her affidavit of 1875, widow Nancy Black described her late husband as a farmer, and herself as having been the head of a household with children at St. Francois Xavier on 15 July 1870. – [474-477] [778-781] Isabelle Elizabeth 8/ 10, Alexandre 5/ 6, Joseph 4, Domitilde 2. See also genealogy; and genealogy. – [480-484] Marie 12, Andrew 9, Alexandre 7, Catherine 5, Francois 2. – [487-491] Bazile 23, Elmire 18, Peter 16, Genevieve 16, Julien 13. In his deposition of 1885, Pierre Bonneau described himself as a plains hunter. He stated that “I left St. Francois Xavier in the year 1874 and I have been living ever since in the North West Territories for the last six years I have lived permanently in the Q’Appelle Valley. On the 15th July 1870 and a long time before and after that date I was living near [?] Hills N.W.T. I have always been a plains hunter,” and named children, five of whom had died. – [494-495] Baptiste 7, Peter/ Pierre 5. – [498-505] Julia 21, Rosalie 18, Francois 16, Mary 12, Zacharia 9, Alex 7, Cuthbert 5, Therese 3. – [508-512] Xavier 25, Thomas 20, Mathew 16, Francois 15, Frisine 14. In their affidavits of 1875, Baptiste Desjarlais and Marie Martin described Baptiste as a farmer. – [515-516] Mary 3, Baptiste 1. 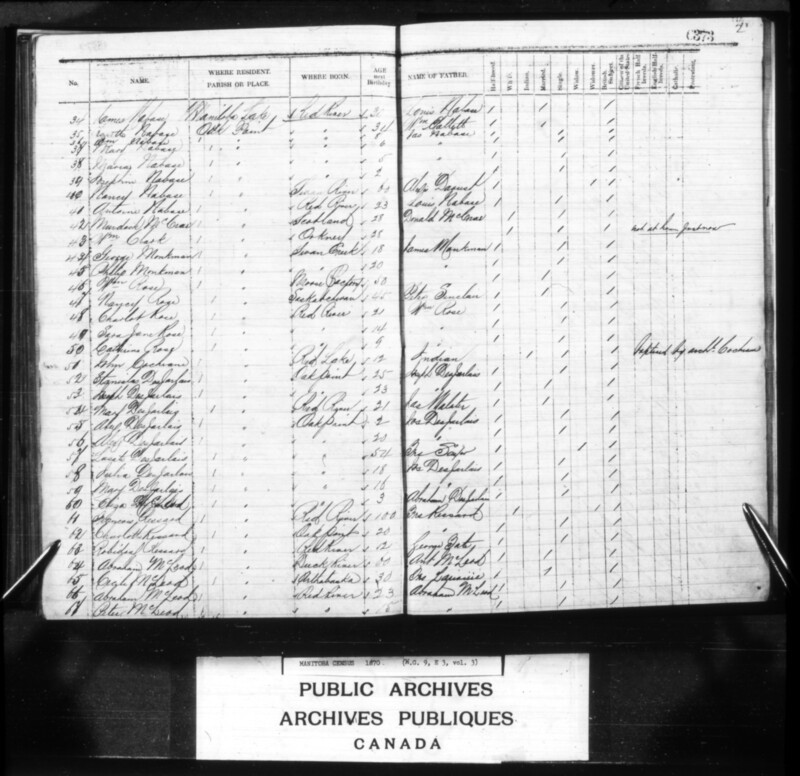 In their affidavits of 1875, Joseph Desjarlais and Isabelle Lafreniere described Joseph as a farmer. – [519-522] Leonie 5, Marie 4, Francois 2, Gregoire 1. This was a hunting family. In her deposition of 1886, Madeleine Desjarlais stated that before her marriage in 1860 she had always resided at Red River in St. Francois Xavier Parish. Afterwards she travelled with her husband, living in the North-West, being temporarily at Red River with her children in 1870. – [571-576] Therese 19, Julia 13, Charles 11, Caroline 8, Modeste 4, Thomas 2. In her affidavit of 1875, Angelique Chalifoux named St. Francois Xavier as her place of residence and described her husband as a farmer. – [550-557] Gregoire 25, Francois 22, Bernard 20, Baptise 18, Rosalie/ LaRose 16, Madeleine 14, Charles 9, Susate/ Suzette 7. 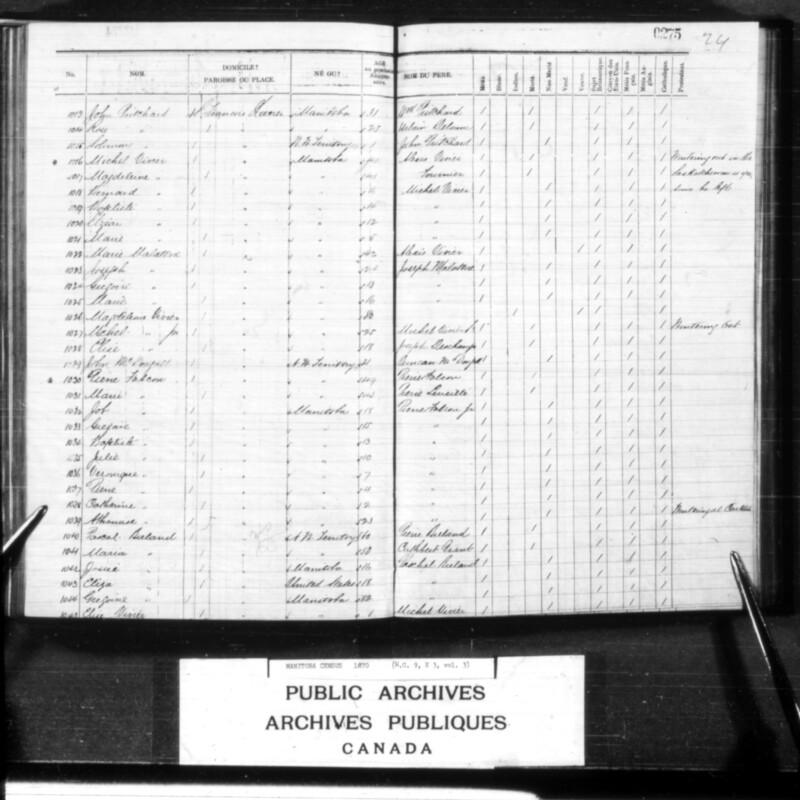 In his affidavit of 1875 (with a list of children), and deposition of 1875 on behalf of his son Charles, Antoine Desjarlais described himself as a farmer. In his affidavit of 1875, Gregoire Desjarlais likewise described himself as a farmer. – [565-567] Hermas 19, Ellen 16, Patrick 13. – [579-587] Paul Alexandre ‘Alex’ 17, Maria 15, Leon 12, Eliza 10, Catherine 6, Philomene 5, John 3, Baptiste 2, Rosalie 1. In his affidavit and his deposition on behalf of his son (both in 1875), Paul St. Denis described himself as a farmer at St. Francois Xavier (as did Cecile Thorne in her affidavit). 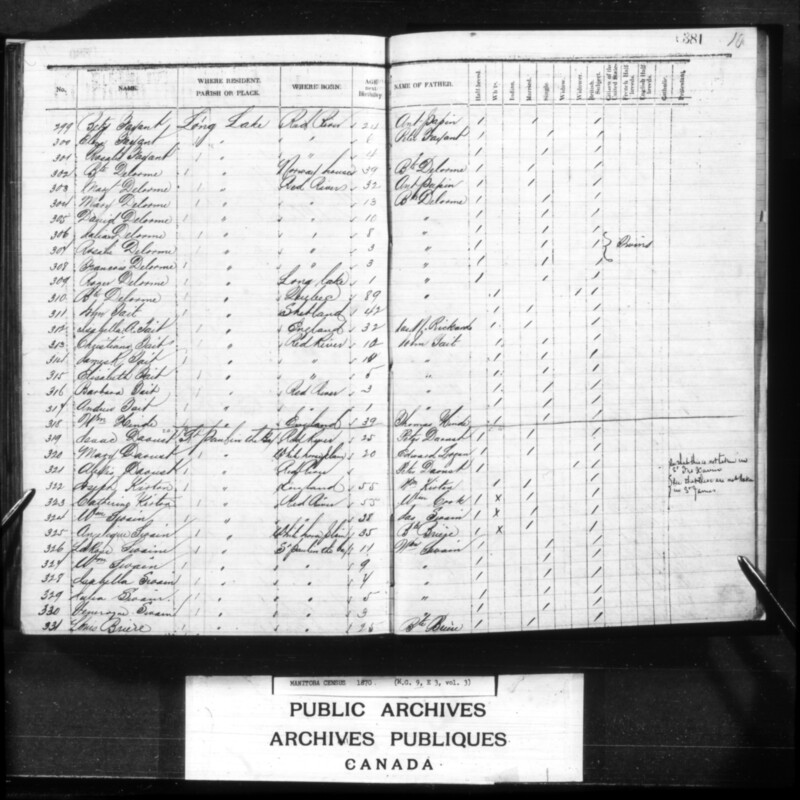 –  Mary Flemin 11 (Métis, daughter of Louis Flemin and an unidentified woman. In his affidavit of 1875, Pierre Ledoux described himself as a farmer. (After 1876 he remarried? to Marie Louise Ledoux, the widow of Joseph Arcand?). – [596-599] Mary 9, Florestine 5, Gregoire 3, Lucia 1. – [602-603] Jean Baptiste 4, Alex 2. In his affidavit of 1877, Baptiste St. Cyr described himself as a labourer at St. Francois Xavier Parish. 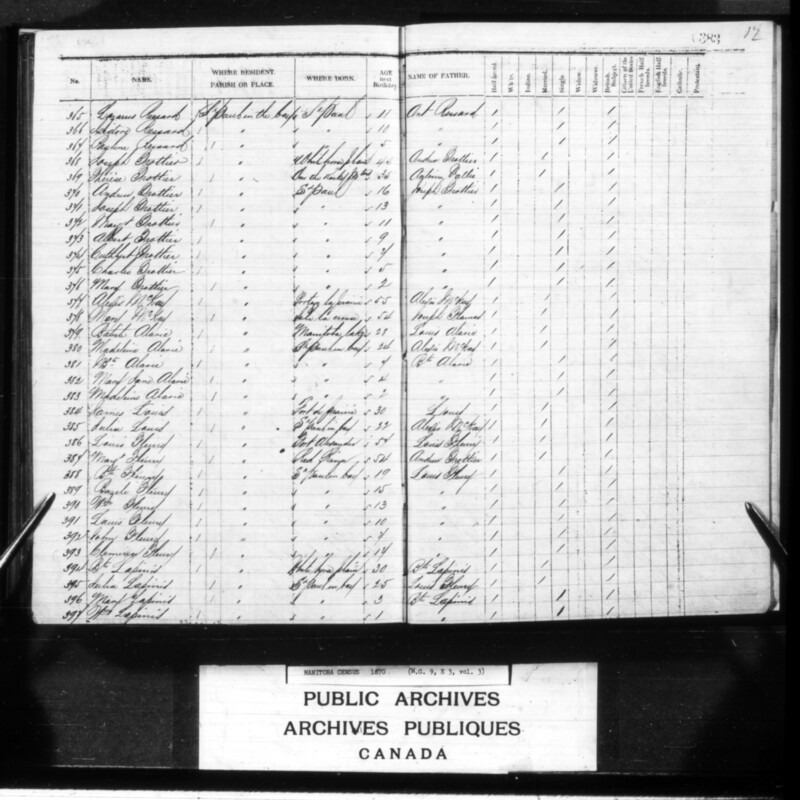 Another, apparently older, Baptiste St. Cyr and wife Justine Mckay (whose father was Ignace McKay) were recorded by the census at St. Francois Xavier Parish [see #4848], with children of the same names as above, but also older. – [606-608] Charles 24, Guillaume 16, Ellen 14. – [530-537] Justian? 24, Norbert 20, Charles 18, Mary 16, Susanne 15, Adeline 13, George 10, William 7. – [525-528] Patrick 8, Mary Therese 5, Suzette/ Susate 3, Joseph 1. In his affidavit of 1875, Joseph Morriseau described himself as a farmer. – [540-547] Francois 13, Elizabeth 13, Amable 11, Elisa 9, Susate/ Suzette 7, Mary 5, Jean Baptiste 3, Antoine 1. In her affidavit of 1875, Josephte Fleury described her husband as a farmer. – [616-617] Peter 5, Francis 3. Described as a farmer of St. Francois Xavier Parish. – [622-625] LaRose 9, Jean Baptiste 7, Charles 5, Betsy 2. In her affidavit of 1875, Charlotte Lepine described her husband as a farmer. –  Napoleon Arcand 7, [629-630] Susate/ Suzette McKay 4, Gaspard McKay 2. In her scrip affidavit of 1875, Annie McKay described her husband as a farmer of St. Francois Xavier Parish. – [747-750] Elzear 7, Ambroise 4, Lizette 3, Roger 1. In their affidavits of 1875, Moise St. Denis and Marguerite Klyne described Moise as a farmer. William Armstrong, watercolour, “Buffalo Meat Drying, White Horse Plains, Red River,” dated 1899. Credit: Library and Archives Canada, Acc. No. 1989-492-2. Copyright: Expired. In her affidavit of 1875, Catherine Cochrane described her husband as a farmer. – [300-301] Eliza 6, Rosalie 4. In their affidavits of 1875, Pierre Faille and Elizabeth Papin (both of whom were born at St. Boniface) described Pierre as a farmer. – [291-295] Suzette 23, John 18, Caroline 15, Roderick 14, Isabella 8. – [286-288] Francois 8, Abraham 4, Mary 2. – [1042-1044] Eliza 18, Josue 16, Gregoire 12,  Justine 10. In his deposition of 1875 on behalf of his deceased daughter, Placidie (who died in 1870, age 18), Pascal Breland described himself as a farmer. Louise Umphreveille was the daughter Edward Umphreville and a Cree woman (apparently of the family name Belly/ Belley). Louise afterwards married John Rowand Sr., who adopted her three children by Pierre Boishue dit Breland). By adoption and marriage, Pascal Breland became the brother-in-law of Henry McDermott, who in turn was the brother of Mary Sarah ‘Sally’ McDermott – wife of HBC Gov. William Mactavish at Upper Fort Garry. – [1318-1321] Marie Rose 10, Ernestine 7, Patrice Tobie 5, Emelie 3, Virginie 1. In his affidavit of 1875, Patrice Breland described himself as a farmer and trader. His wife, Helene Dease (born at St. Boniface), described Patrice as a farmer. Patrice Breland’s father was, by adoption and marriage, brother-in-law to Henry McDermott — the brother of Mary Sarah ‘Sally’ McDermott who was the wife of HBC Gov. William Mactavish at Upper Fort Garry. Patrice was in turn related by marriage to William Dease (the uncle of Patrice’s wife, Helen Dease), who was opposed to the installation of a provisional government at Red River. Patrice Breland was a member of the Convention of Twenty-four in November of 1869, and by 26 February 1870 his allegiance was clearly to the Provisional Government. As early as 7 April 1870, as a captain in the Settlement Guard, he was appointed “Envoy to the Plains,” tasked with telling the winterers (including those in his father’s camp of Qu’Appelle buffalo hunters), that there was peace in the settlement and HBC trade business would be open as usual. – [1325-1328] Maxime 28, Pauline 18, Chrysostome 16, Elzear 14. In their affidavits of 1875, Pierre Poitras Sr. and Marie Brilliere described Pierre as a farmer. The boundary of St. François-Xavier west and White Horse Plain appears to have overlapped at Pierre Poitras’ residence, as Poitras was elected to the Legislative Assembly of Assiniboia as representative for the riding of Baie St. Paul and White Horse Plain. The overlap was apparently a limited sort of loop, as much of St. François-Xavier Parish lay further to the west than Poitras’ lot. – [3-8] John ‘Johnny’ 14, Elise/ Eliza 12, Philomene 10, Paul 6, Alexandre 4, Judith 1. In their affidavits of 1875, Paul de Laronde and Marguerite Sinclair described Paul as a farmer. Nevertheless, Nicole J.M. St-Onge, Saint-Laurent Manitoba: Evolving Métis Identities 1850-1914 (Regina: Canadian Plains Research Centre, 2004), 19-20, describes Louis Denis Delaronde Sr. as a trader and freighter; suggests that all of his children “were actively engaged in trading,” by 1870; and implies they were not as interested in agriculture as were other Métis settlers. While this might have been true for Louis Laronde Jr. [a.k.a. Sr.], his brothers at Oak Point described themselves as farmers (see entries #2657, #2798 below). – [11-13] Joseph 8, Peter 6, Genevieve 3. – [16-21] Julie 17, Roger 15, Caroline 13, Paul 9, Alexandre 6, Annie 2. 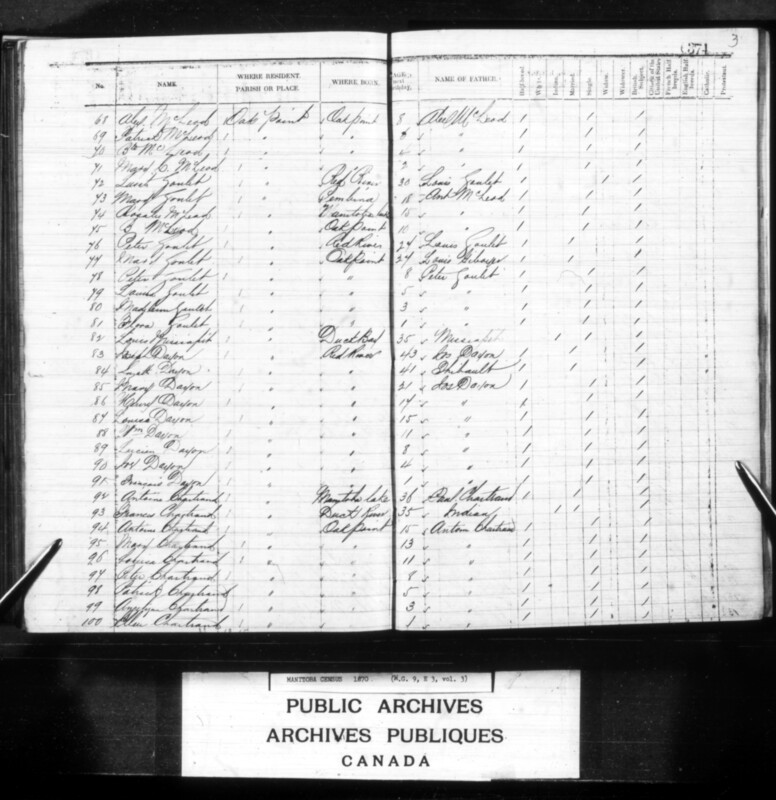 In their affidavit of 1875, Paul Boucher and Louise Marsalais described themselves as residing at St. Boniface (as they had been on 15 July 1870), and Paul as a farmer at the same place. In his affidavit of 1875, their son, Roger Boucher, also described St. Boniface as the family’s home parish and his occupation as a labourer. – [24-29] Catherine 14, Pierre/ Peter 12, Roger 10, Charles 7, Marie Rose 4, Philomene 2. As of their affidavits of 1875, Marie Bousquet (who described her husband as a farmer at St. Charles by that time) and children — among whom Pierre described himself as a farmer — resided at St. Charles Parish. On 15 July 1870, however, they had been at Oak Point. – [32-33] Cyrille 16, Jean-Baptiste 13. – [36-39] William 8, Mary 6, Maria 5, Josephine 2. In their affidavit of 1875, James Nabase and Suzatte Hallet described James as a farmer at St. Laurent Parish MB. –  Antoine 23 [c. 1847]. 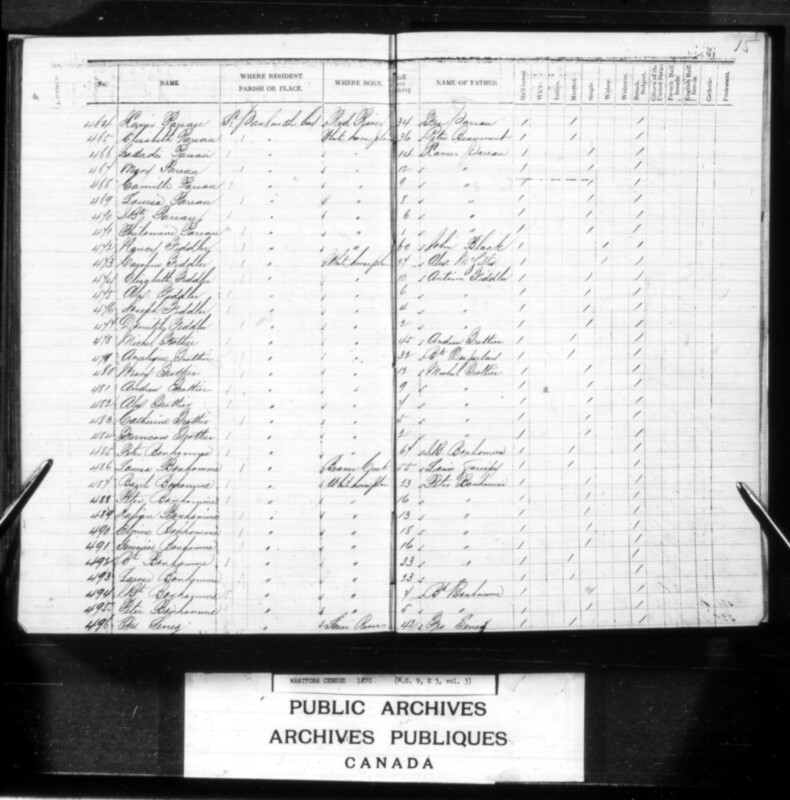 In his affidavit of 1875, George Monkman described his mother as the head of the family on 15 July 1870 in what was the parish of St. Laurent by 1875. By that year, George described himself as a farmer. In his affidavit of 1875, Philip Monkman described his mother as the head of the family on 15 July 1870 at Oak Point. By 1875, Philip described himself as a labourer. – [48-50] Charlotte 21, Sara Jane 14, Catherine 9. In his affidavit of 1875, William Rose described himself as a farmer. In his affidavit of 1875, Stanilas Desjarlais described himself as a farmer. 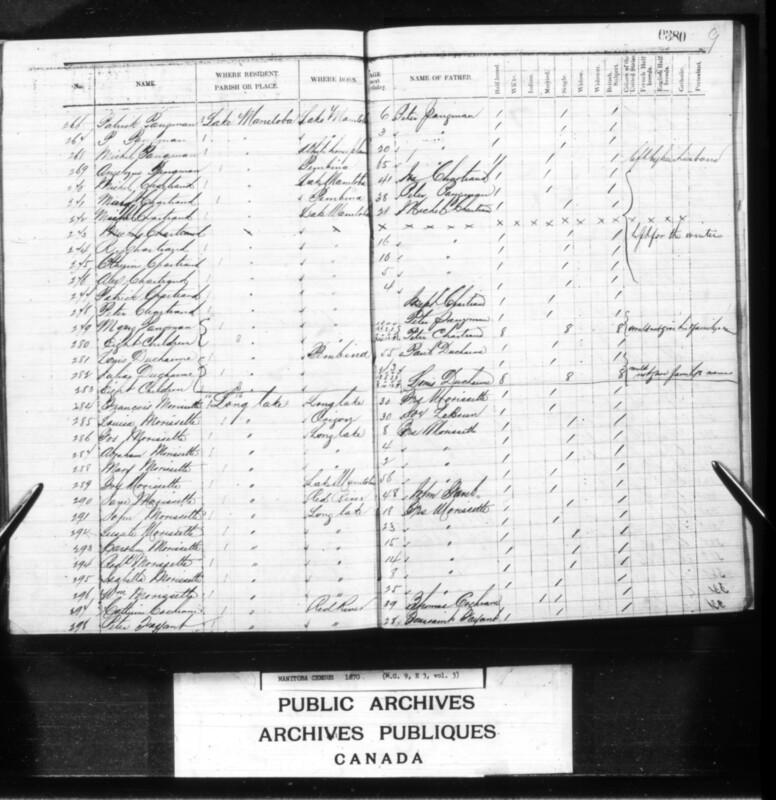 In his affidavit of 1875, Alexandre Desjarlais described himself as a labourer. – [58-59] Julia 18, Mary 16. In her affidavit of 1875, widow Josephte Sayer described her late husband as a farmer. – [66-67] Abraham Jr. 23, Peter/ Pierre 15, [68-71] Alexandre 8, Patrick/ Patrice 6, Jean Baptiste 4, Mary/ Marie Celina 2. In his affidavit of 1875, Abraham McLeod Sr. described himself as a farmer — as did his wife Cecile in her deposition made on behalf of her children. In his affidavit of 1875, Abraham McLeod Jr. described himself as a labourer. – [78-81] Peter/ Pierre 8, Louisa/ Louise 5, Madeleine 3, Flora/ Florine 1. In their affidavits of 1875, Pierre Goulet and Marie Charboyer described Pierre as a farmer. – [85-91] Mary 21, Henry 17, Louisa 15, William 11, Lucien 8, Joseph 4, Francois 1. – [94-100] Mary 13, Louisa/ Louise 11, Peter/ Pierre 8, Patrick/ Patrice 5, Angelina/ Angelique 3, Ellen 1. In his affidavit of 1875, Antoine Chartrand described himself as a farmer. – [103-105] Peter 18, Norbert 15, Michel 12. In his affidavit of 1875, Paul Chartrand Sr. described himself as a farmer. In their affidavits of 1875. Antoine Desjarlais and Marie Chartrand described Antoine as a farmer. – [111-112] Angelique 4, Louis 2. – [115-120] Marie Angel 10, H.? [X.? : Xavier?] 8, Caroline 7, Adelaide 5, E. 3, William 1. In their affidavits of 1875 Paul Chartrand Jr. and Madeleine Mallet described Paul as a farmer. – [123-127] Mary 9, LaRose 7, Moses 6, Alexandre 3, Ursule 2. In his affidavit of 1875, Louis Chartrand described himself as a farmer. – [130-132] Philomene 5, Eliza 3, Susanne 1. – [137-138] Monique 50, Therese 48. – [143-147] Mary 20, Nancy 18, James 16, Ellen 10, Charlotte 10. In her affidavit of 1875, widow Mary Richard identified her late husband as a farmer. In his affidavit, their son, James Monkman, described himself as a farmer. – [149-155] William 30, Francois 24, Jane 20, Annie 18, Catherine 16, Marguerite 14, Alexandre 12. – [560-562] Peter 5, Jean Baptiste 3, Mary 1. [Antoine 2?]. In her affidavit of 1875, Marie Falcon described her husband as a farmer. In their affidavits of 1875, Pierre Jr., Michel, and Magloire Chartrand described themselves as farmers. – [263-265] Marguerite 12, Lizzie 10, Peter 8, [266-267] Patrick 6, Pierre 3. – [272-277] Michel 21, R. 16, Catherine 16, Alexandre 5, Patrick 4. – [228-230] Jean-Baptiste 5, Mary Ann 3, [?] 1. – [220-225] Peter 9, Joseph 8, John 6, Marguerite 5, Francois 3, “Baby” 1. – [216-217] Michel 20, Marie 18. In her affidavit of 1875, Louise Ducharme described her husband as a farmer. Their son, Michel Lavallee, also described himself as a farmer. – [251-260] Jean Baptiste 23, Lucie/ Lizzie 18, Jacob 16, Cuthbert 14, Louisa 12, Antoine 10, Marianne 8, Isabella 6, Eliza/ Elise 4, Catherine 2. In his affidavit of 1875 and a deposition made on behalf of his children, Baptiste Ducharme described himself as a farmer at St. Laurent Parish MB. In her affidavit of 1875, Catherine Allary also described her husband as a farmer. In his affidavit of 1875, Charles Charboyer described himself as a farmer. 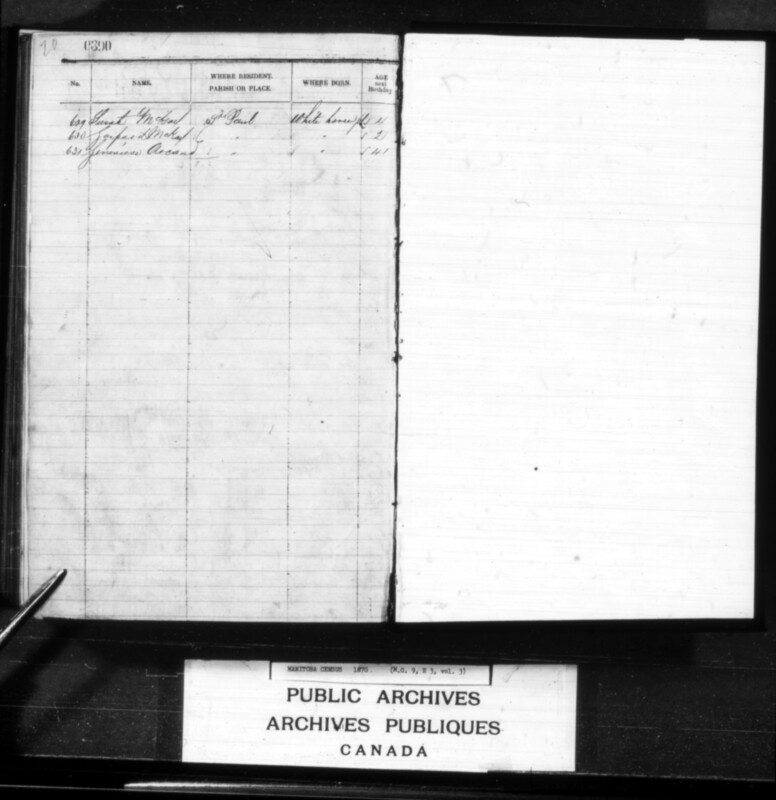 In his deposition of 1901, Norbert Charboyer also described his father as farming at St. Laurent Parish. – [233-234] Andrew 2, Jean-Baptiste 1. 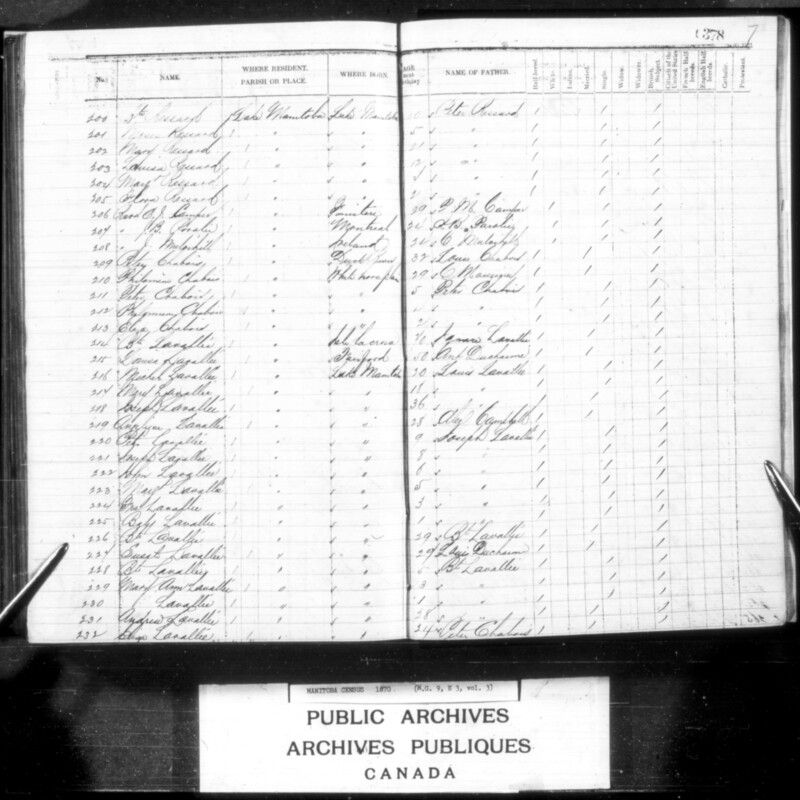 In their affidavits of 1875, Andre Lavallee and Eliza Chaboyer described Andre as a farmer at St. Laurent Parish MB. –  “3 Children” ages 15, 12, [Nancy] and/ or [Marie] 4. In his affidavit of 1875, Joseph Chaboyer described himself as a farmer at St. Laurent Parish MB. In his deposition of 1875, he names also his sons Joseph (born 1867), and Pierre (born 1869). In his deposition of 1875 on behalf of his children, Norbert Chaboyer described himself as a farmer. – “one child” age 10. 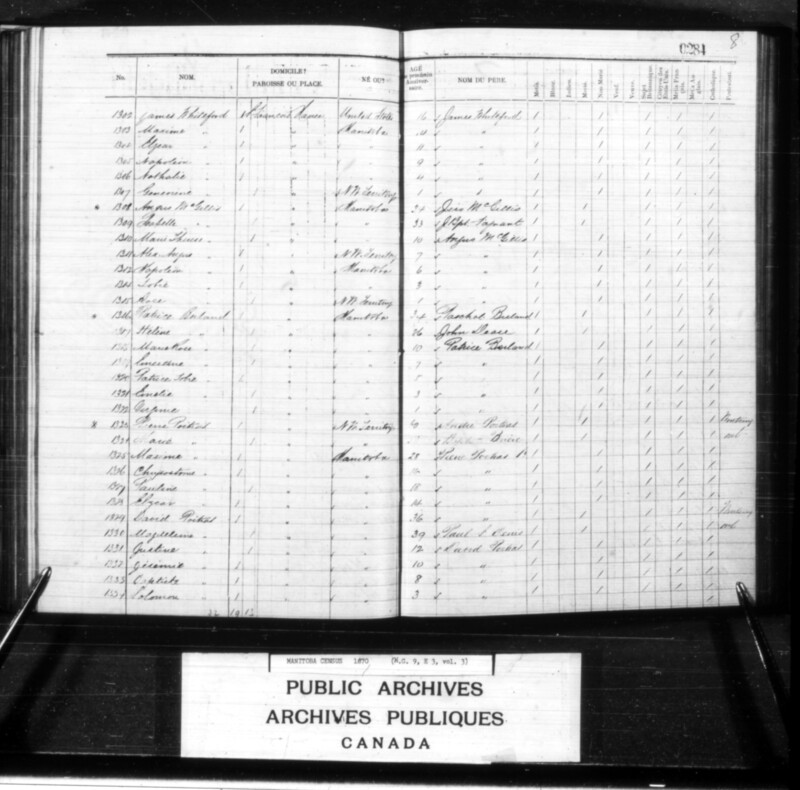 In depositions made (in 1901) on behalf of his children — Philomene (who died 1871 “before treaty’), Antoine (who died 1875 “in treaty”), Marie (who died 1881 “in treaty”), and Jean (who died 1882 “in treaty”) — Antoine Chaboyer described himself as “of St. Laurent [where he had lived “about 13 years”] and before that Swan Creek.” Antoine had taken treaty with the Dog Creek Band (No. 4 Lake Manitoba Band, Treaty 2), but was discharged to take scrip in 1885, along with his daughters Arzelie (born 1885), and Marie Virginie (who was placed in an asylum at Brandon as “mentally unsound”). – [211-213] Peter/ Pierre 5, Philomene 4, Elise/ Eliza 2. In his affidavit of 1875, made on behalf of his children, Pierre Charboyer described himself as a farmer at St. Laurent Parish MB. In her affidavit of 1875, Philomene de Montigny also described her husband as a farmer. –  Mary 21, [196-199] Antoine 21, Michel 18, Theophile 16, Alexandre 13, [200-201, 203-205] Baptiste 10, Louise 12, Jean-Baptiste 10, Marguerite 7, Moses 5, Flora 2. In their affidavits of 1875, Pierre Richard and Isabelle Chartrand described Pierre as a farmer at St. Laurent Parish MB. In his affidavit, their sons Antoine and Michel Richard also described themselves as farmers, while son Alexandre described himself as a labourer. – [190-193] Peter/ St. Pierre 20, Isabelle 14, Peter/ Pierre 12, Susanne 10. In her affidavit of 1875, made on behalf of her children, widowed Marguerite described her late husband as a farmer. – [171-180] Eliza 18, Louis Jr. 16, Gaspard 14, Charles 12, Jean Baptiste 10, Joseph 8, Josephte/ Suzette 6, Alexandre 4, Marie Pelagie 2, Magloire 1. In her affidavits of 1875 on behalf of her grandchildren, widow Madeleine Boucher-Laronde of St. Laurent Parish MB explained that the children’s father, Louis Laronde Jr. [a.k.a. Sr.] was absent and their mother, Judith Morin, had died. In his affidavit of 1876, Louis Laronde Jr. (grandson of Madeleine Boucher) described himself as a farmer at St. Laurent MB. – [183-187] Philomene 11, Etienne 9, Madeleine 8, Marie 6, Marguerite 1. In their affidavits of 1875, Etienne Laronde and Cariline Carriere described Etienne as a farmer at St. Laurent Parish MB. – [158-164] Fulgence 19, Marie Josephine 17, Damase 12, Louis 10, Albert 8, R. 6, Alexandre 3. In her affidavit of 1875, Genevieve Martin described her husband as a farmer. 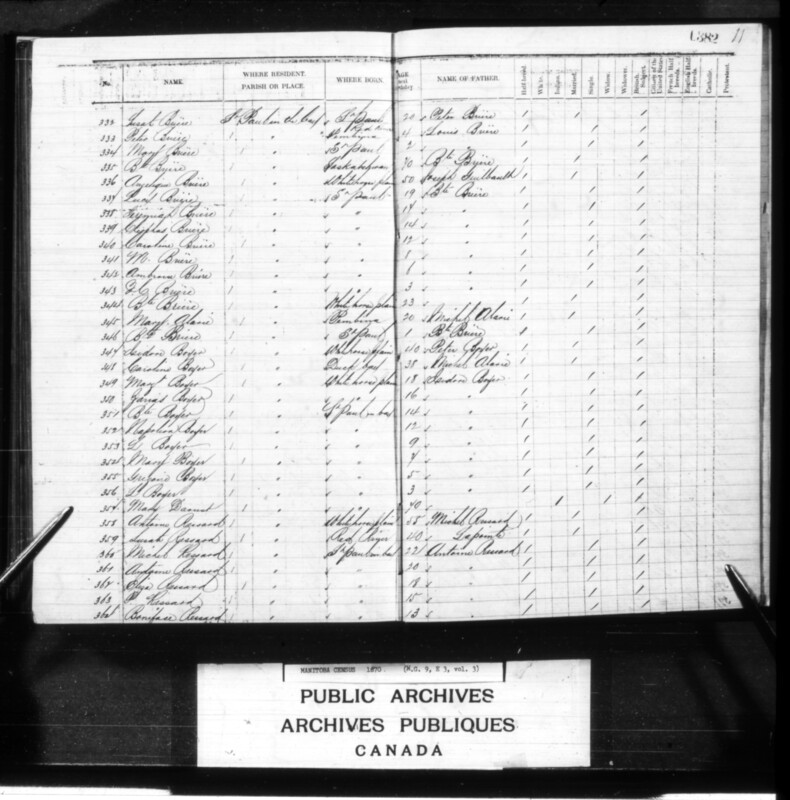 In his affidavit 0f 1875, Fulgence Boyer stated he was born in St. Francois Xavier Parish and worked as a labourer at St. Laurent Parish MB, where his father had resided on 15 July 1870. In her affidavit of 1875, Marie Josephine Boyer stated that she had been born at St. Francois Xavier and had married John Campbell, a farmer at St. Laurent). 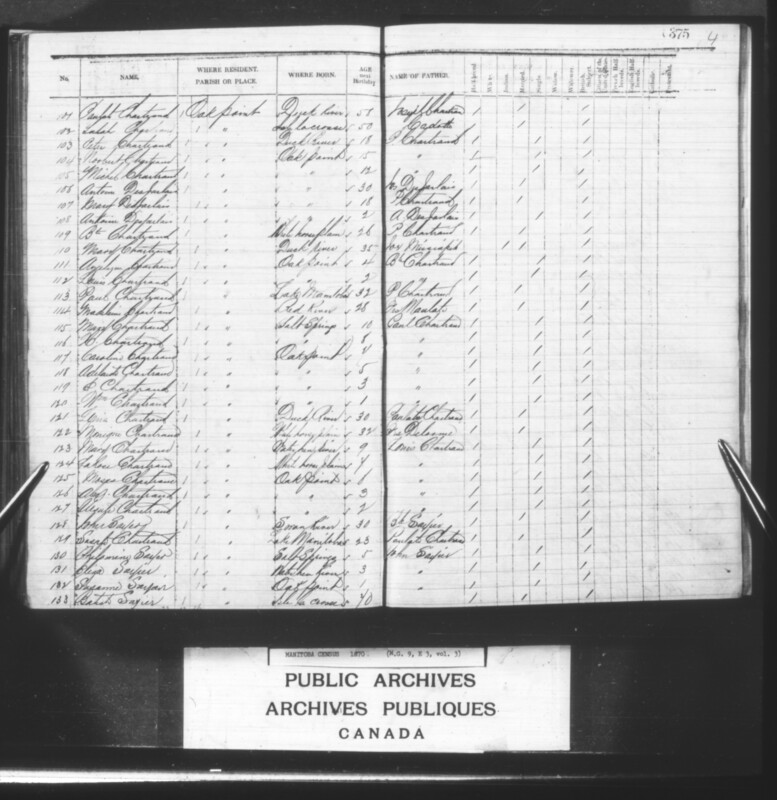 In his affidavit of 1876, Antoine Bercier stated that he was born on “the plains where my parents were wintering out,” and described himself as a farmer at St. Francois Xavier. In her affidavit, Justine Boyer also described Pierre as a farmer of that parish. 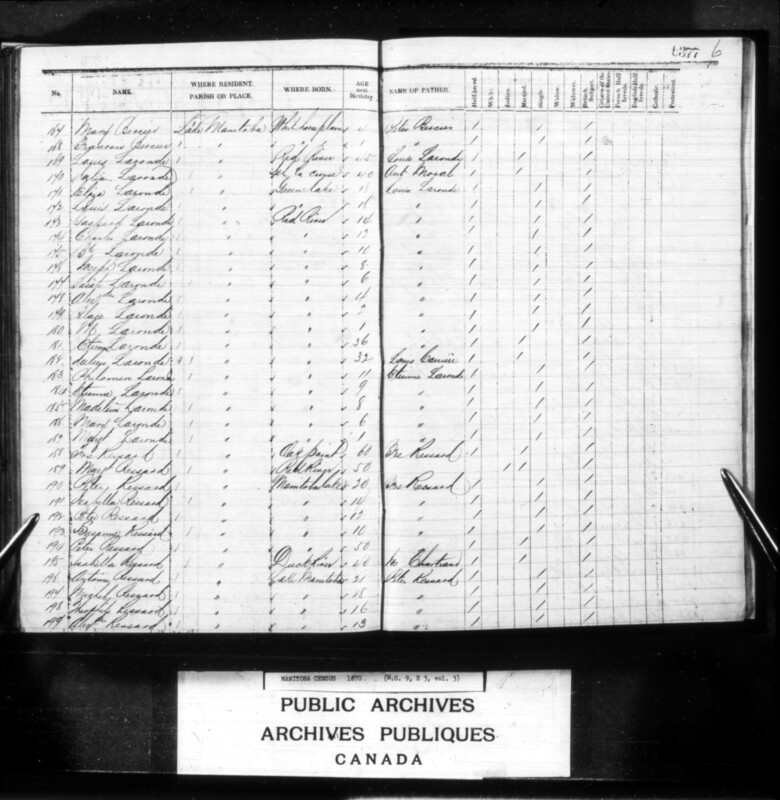 The census of 1870 indicates their children were born at White Horse Plain. Re 19-24 Louis De Laronde (Julie Morin daughter of Antoine Morin and Pelagie Boucher. Many thanks — the entry has been updated.